Get ready for a Christmas you will never forget! You are invited to join us on a special holiday adventure for the whole family. We’re off to Nepal to spend Christmas and New Year’s trekking with our family and friends in Everest’s Khumbu region. We have selected the dates to match school holiday schedules and have designed the itinerary with kids in mind – with extra rest days and shorter hiking distances. With special visits to schools, monasteries and even a medical clinic, your kids are sure to learn a lot about life in a place very different from their own homes. We will encourage local families to trek with us some days so that the kids can learn from each other and play together. Don’t have kids? That’s okay, you’re still welcome to join us! We will travel from Kathmandu to Lukla on December 23rd and will arrive in Namche in the afternoon on December 24th. You will wake up Christmas morning for a short walk to the National Park Overlook to get your first views of Mount Everest before returning to the cozy lodge to open presents and share a special Christmas breakfast. You will have the rest of the day to relax in Namche, the economic hub for the entire Khumbu region. Since Christmas is not a holiday in Nepal, businesses in Namche will be open for you to shop and explore before it is time for a Christmas dinner feast. 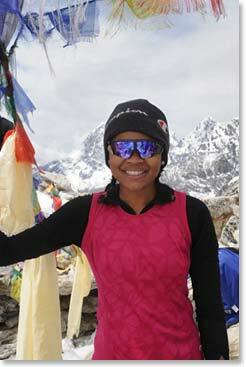 Our highpoint on the trek will be Pangboche at 13,123ft/4000m. 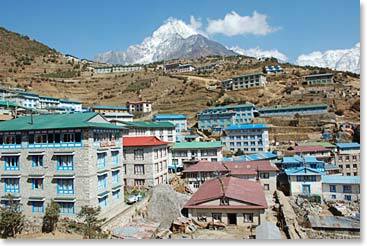 Here we will have another rest day for visiting the local lama, venturing out on a day hike or simply relaxing in the lodge which has fantastic views of Ama Dablam and Everest, and unmatched hospitality. We will return to Lukla for a New Year’s Eve celebration with our new Sherpa friends before returning to Kathmandu. The trip begins and ends in Kathmandu where you will be able to visit the infamous Monkey Temple and other sites in this exciting city. We recommend that you fly through Bangkok as it is the most direct and most comfortable way to travel. If you have a few extra days at the end of the trek and would like to spend some time in Thailand, we have some great family friendly suggestions for you! While you may imagine blustery, cold weather in the Himalayas in December, it is actually a beautiful month to go trekking. It is the driest month in Nepal and the temperatures are quite mild. Seasoned trekkers in Nepal will all say the same thing, that December is the nicest month to trek –dry trails, quiet lodges, few clouds, and fantastic views. For more information visit our website or contact our office at 403-609-4148 or sara@bergadventures.com. Reincarnate Lama Returns to Thame!